November ushers in the fall season which is one of our favorite times on the campus of the Nebraska College of Technical Agriculture. Because of the cool temperatures, NCTA students find even more enjoyment when they are doing their chores on the college farm. They look forward to feeding the horses, checking the livestock and exercising the dogs at the veterinary technology complex. We are far enough into harvest to see that we will have some good yields of corn, soybeans and hay from both our irrigated and dry land acres. 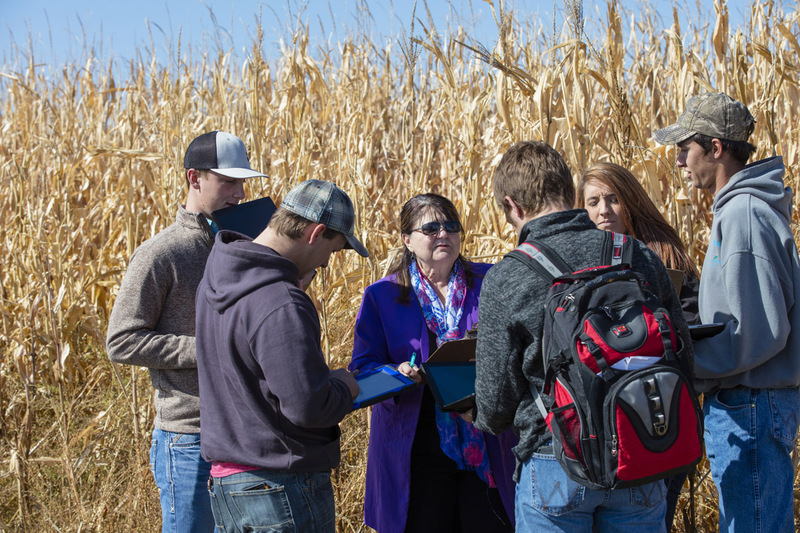 Aggie students play a prominent role in planting and harvesting crops. In a harvest methods class, they are bringing in the crops by working with our farm manager. Students operate farm equipment such as our combine, tractors, and farm trucks. Animal science and livestock management students assist in processing calves at weaning and feeding cattle in our campus feedlot. Our cow herd is back from summer range and grazing near the campus. Students feel pride when working the feedlot because some of the spring calves are a result of cattle artificial insemination skills the students learned in A.I. class. Students also took 12-hour shifts which included nighttime calving so they could monitor for any birth difficulty. As a result of the students’ diligence, we have not lost a single calf this year. This nice, cool weather provides equine management students and the NCTA Ranch Horse team enjoyable class time riding horses outside, primarily in the protected pasture of Aggieland. Outdoor experiences with harvest and animal husbandry also provide students with opportunities to observe campus wildlife. The Medicine Valley in which NCTA is nestled brings turkeys, pheasants and deer in the campus woods and crop lands. During early morning chores, students regularly encounter our resident mule deer herd or hear the sound of coyotes off in the distant hills. All of these blessings surrounding campus serve to remind us that November is the month of gratitude – a time to recognize and appreciate the many good things we experience in our daily lives. We feel grateful to be working in agriculture – a noble career focused on producing healthy, abundant and low cost food for a hungry and growing world. We feel grateful to be working at a college helping young people grow and develop. We appreciate their boundless energy and infectious enthusiasm. We appreciate working in a community with neighbors who regularly support each other with small, friendly gestures like handwritten thank you notes, food treats left on your desk or at your front door, and hand-painted rocks placed randomly around the community with messages of encouragement, support and thanks. As we approach Thanksgiving Day, Aggie students are sharing in a “Countdown to Kindness” with daily gestures such as a smile, handshake with a new acquaintance, and compliments to others. Aggie students, staff and faculty are a welcoming community. We are grateful for a learning and living environment that brings joy to others through intentional or random acts kindness. Nearly a thousand guests will be visiting NCTA before Thanksgiving. District FFA contests this week gathered more than 800 students and advisors. These next two weekends we will host public clinics in horsemanship and reining, and stock dog handling, as well as Discovery Day for prospective students and their families on Nov. 12, and a Grazing Lands Traveling Roadshow on Nov. 14. Welcome. And, this weekend, as our nation and community observes Veterans Day, we extend our sincerest appreciation to all who have served our country and continue in active duty today. To each of you and your families, we are grateful. Thank you.